Discussion in 'Discussion & Q&A' started by Malevolence, Jul 7, 2009. Awesome guys, thanks a lot! There are a solution about bugs in Sonic 1 driver? I mean, when especially there are songs with FM Drums e.g, the 1UP jingle or Hurt Spike SFX interrupts some channels, I have a trouble with songs with FM Drums, seems to be the channels 5 and 6 disappear when "the 1UP jingle or Hurt Spike SFX" sounds in game. I need help with that and I'm using Sonic 2 Clone Sound Driver in my hack. The higher numbered channels have a lower priority, so they are more likely to be replaced when a sound effect is playing. You want to put the parts more important to your song in the lower numbered channels. Channel 6 is the exception because it is replaced with DAC in most songs so sound effects never use that channel. The 1UP jingle is its own separate piece of music and the level music fades in afterward. An additional note, PSG1 has lower priority than PSG2. SFX Hurt Spike also interrupts the FM 6 "FM Drums" whereby, I never understood which was the reason than that bug is still presents. 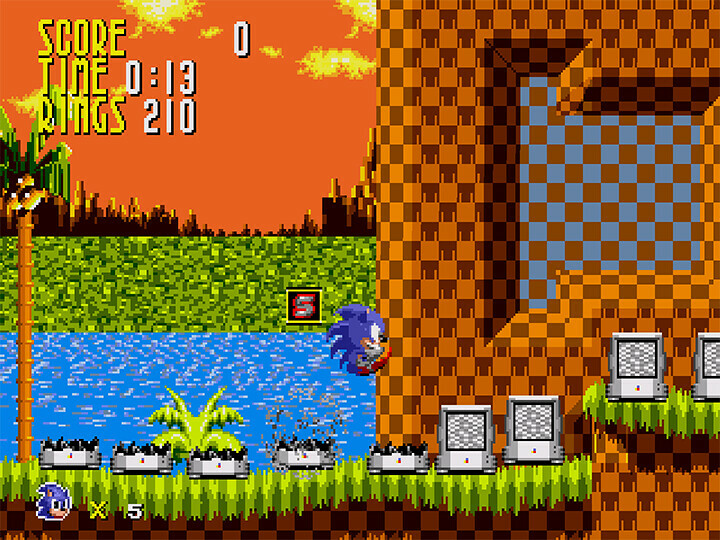 Special Stage not use DAC, but I remember than there was a tutorial for this problem but for old disassembly "Sonic 1 2005 Hivebrain disassembly". I wanted to fix that bug in MegaPCM driver and S1HS "S1 Hacking Studio" the labels and subroutines was deleted. I don't know if in present there are a method or some help for fix that bug, I'm able to pick up any suggestions for that (unless someone recommend me use other sound driver for fix that). To be correct, there is no "priority" for channels used by sound effects. It's just that certain SFX play on certain channels. The ring effect for example plays on FM 4/5. "Jump" plays on PSG 1 and the skidding sound effect plays on PSG 2+3. Channels that are safe to use are FM 1, 2 and 6. (FM 6 only if you don't use the DAC.) FM 3 isn't occupied by SFX too often. FM 4/5 and all PSG channels are commonly used by SFX. There are no SFX that play on FM 6 (the sound driver doesn't support SFX on FM 6) - maybe you accidentally put the drums on another FM channel? Dj. Joker 27 and ProjectFM like this. Yes that's the tutorial, but in MegaPCM and Sonic 2 Clone Sound Driver was deleted some codes and I can't fix that, this is not a lazyness, no, only just I told here that issue. And it's true Sonic 1 don't use FM 6 FM Drums, I put the FM Drums in channel 1 or 2 and bass in channel 3, but seems to be when the fade out in 1up sounds or SFX Hurt Spikes, the channel 5 and 6 is missing and I don't know how to fix that bug in those drivers. Sorry for bother again, but that tutorial is for old disassembly "Sonic 1 2005 Hivebrain disassembly", I guess. Edit: Testing the SFX Hurt Spikes or SFX Hurt not problem, the FM5 is the issue when fade out sounds from the 1UP jingle. Apart from using individually bit shifting every single byte into a register and then anding it, I didn't see a more straight forward solution. I know I can use ror to swap the nybbles, but then I'd still have to individually swap the four bits in one, so there's no real gain. What exactly would make a Genesis ROM Hack become a 32X ROM Hack? I'm asking this question code wise, in the instance of Sonic 2 (Github Version) for example. Would I need a different compiler to make it into a 32X game? Would I need follow-up ASM code that makes it compile properly as a 32X game and not a Genesis game? If so, what am I looking at exactly in the case of Sonic 2? I'm simply asking since I want to fully utilize the Sonic 2 Clone Driver's capabilities on Sonic 2 (Github Version) and because I thought it'd be a good challenge to undertake, but I'm not sure how to exactly go from Genesis to 32X, since I've only done a Master System ROM Hack of Sonic 2 SMS and a basic Sonic 3 (& Knuckles) ROM Hack. You'd need to do a number of things. One of which being getting the MARS initialization code implemented at $3F0 in the ROM. The 32X also uses bankswitching for the ROM, with the first bank being located at $880000 and another 4 swappable banks at $900000, so you'd need to take that into account. You'd also need a master and slave SH-2 program to run along with the 68000 code. You could take a look at the dummy 32X program in the Clone Driver's GitHub, but I'm unsure of how well it works, to be honest. That's what I know that got a 32X ROM booting at least. I want to import art into S1 via SonLVL as some others have done, but I don't know where to. I am using an old version of SonLVL (I work with S1 Hivebrain keep in mind.) but I've seen people import art around the same time that the tool would be dated. It's been a while since I last did any hacking, but I seem to remember that you can only use IDs from $00 to $7F in Sonic 1, because the MSb is used for the "remember status" flag. Renegade, MarkeyJester and EMK-20218 like this. You'd need to do a number of things. After looking into the 'number of things' you gave me, I think I don't need PWM support. Twas a silly idea to port to the 32X. You can use the latest version of SonLVL for art importing, you just won't be able to see as many objects properly. You can import tiles, blocks, or chunks by clicking the Import button above the respective list in the Art tab, or import directly into the FG/BG layouts by right clicking and dragging to select an area, right click in the selection to bring up the context menu, then select Import. I don't know if that's the same for the version you have. It is recommended that the art you import be palettized/indexed and match exactly to the level's palette in SonLVL. You can try to import full-color images but the results may not be ideal. You can have objects all the way up to $FF, the catch is that you can only put objects up to $7F into the level layout, because as nineko said, the "remember state" flag is stored in the upper byte of the object id in the level layout format. You can absolutely spawn objects from $80 to $FF from code though, so if you want to add more objects that can be part of the level layout, what you could do is change the object id some of the objects that are only ever spawned through code into slots $80 and up, and then put your level objects into the now freed up slots. Things like explosions, flickys, the points object, the hud, title cards, and so on are all good candidates to be moved to higher slots. EMK-20218, TheInvisibleSun, Renegade and 3 others like this. Anyone know if Mid2smps supports flanger effect? I've seen two songs from Batman and Robin makes a flanger effect so, I haven't idea if there are a trick or something to make that effect. SMPSConv is good to port music, but you might also want to use the music pointer fixer before converting. Take that with a grain of salt though, I don't port often. You can find SMPSConv here, http://sonicresearch.org/community/index.php?threads/smps-converter.2523/, and music pointer fixer on SonicRetro. I must tell you though, I'd use MegaPCM if you want to have the song's DAC samples. I've never really used SMPSConv, but I do a lot of work with sound drivers. Music porting is way too involved for a newcomer. You need to be familiar with all kinds of sound driver differences: PSG envelopes, DAC samples, etc. Whatever you do, don't use Music Pointer Fixer. That thing's awful. It was probably good for its time, but it's ancient and gets tons of stuff wrong. I suppose the simplest way to port music nowadays is by installing a custom sound driver, and adding music in SMPS2ASM format. Custom drivers let you skip a lot of the in-depth stuff, but installing them is a task of its own. Flamedriver might be the best option, but I'm pretty sure there isn't a guide for installing it in Sonic 1. Tanman Tanner, EMK-20218 and AkumaYin like this.